While we can’t control the rain itself, we can employ some landscaping strategies to direct the path of the water and reduce garden damage. Since erosion is a common problem in our hilly residential areas, a first defense against the destructive effects of rain runoff is to stabilize slopes. The most effective techniques for erosion control are determined by the steepness of the terrain. 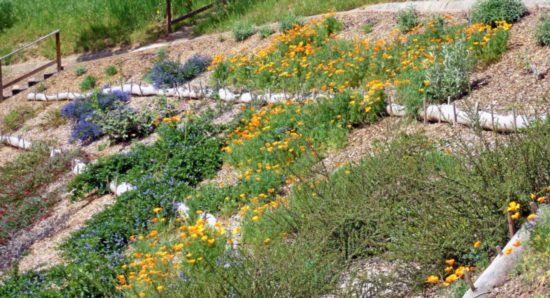 In its “Homeowner’s Guide to Erosion Control,” the California Natural Resources Conservation Service provides guidelines for slope stabilization based on the extent of the grade. Moderate slopes, with less than a 33 percent grade, can be protected with plants and mulch. Plants selected for erosion control should have deep spreading root systems. A mix of ground covers, perennials, shrubs, and trees is ideal. Some native species that are good for slopes include eriogonum (California buckwheat), arctostaphylos (manzanita), rhamnus (coffeeberry), ceanothus (California lilac), and baccharis pilularis (coyote brush). Bare soil between the plants should be covered with a layer of organic mulch such as small bark or wood chips that are not likely to wash away easily. Avoid the finely shredded bark that is sometimes sold to cover slopes. It is a fire hazard. The steeper the slope the more likely additional structural support will be needed for stabilization, Slopes with grades between 33 and 50 percent can also be planted, but erosion controls such as jute netting and straw wattles (long fiber-encased straw tubes) may be need to be installed to retain the slope until the plants can take over. 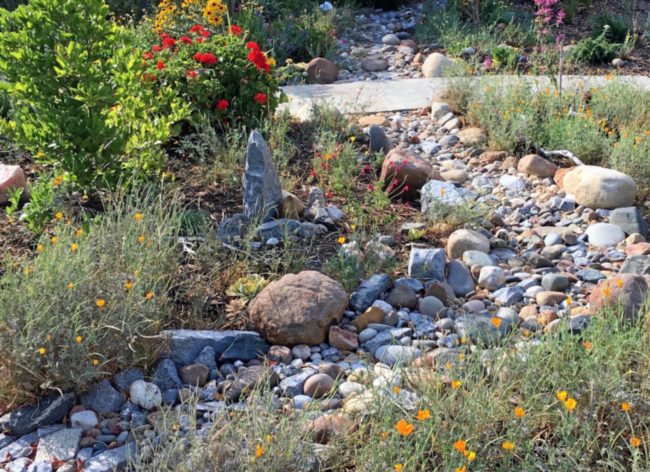 Additional drainage systems include berms, swales, rain gardens, wattles and water permeable surfaces. See Rain, Rain, Don’t Go Away. Also see A Guide to Straw Wattle Installation, Marin County. For further information regarding hillside gardening and understanding soil erosion, see Gardening on a Hillside, Sonoma Master Gardeners, and Understanding Soil Erosion in Irrigated Agriculture.